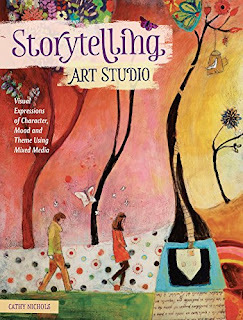 I really enjoyed reading through Cathy Nichols' new book Storytelling Art Studio, published by North Light Books. I love the way she has organized the book, and I also love that her artwork is very very different from mine. That way, I'm not as likely to fall into the mistake of copying so much as just thinking about how I can use her techniques in my own work. Cathy's chapters build one upon another, but you can also skip around in order to simply try out the ideas that strike your fancy. In order, the chapters cover creating characters, setting the scene, altering the mood, adding conflict, expanding the plot, adding a moral, storytelling with symbolism, repeating a motif, and titling your piece. Each chapter has a step by step demo if you'd like to work through a similar piece. One of the most helpful features, I think, is the broad variety of backgrounds that Cathy teaches throughout the projects. She shows you, through the demonstrations, how to paint an emotional color field, a gradient, a collaged background, sgraffito and mishima on clayboard, vignettes, a black and white photo background, and found stories in an altered book page. I find Cathy's art style delightful, which is another very good reason to take a long look at this book, preferably accompanied by a nice cuppa something good! I am sending your link to my friend. She does watercolor/drawings and this looks right up her alley...would be good for me to trace! HA I can't draw AT all!